This will be a Pale Ale — hoppy, but not so hoppy as an India Pale Ale or IPA. There will be a 60 minute total boil, 55 minutes with the bittering hops then the final 5 minutes with the finishing hops. 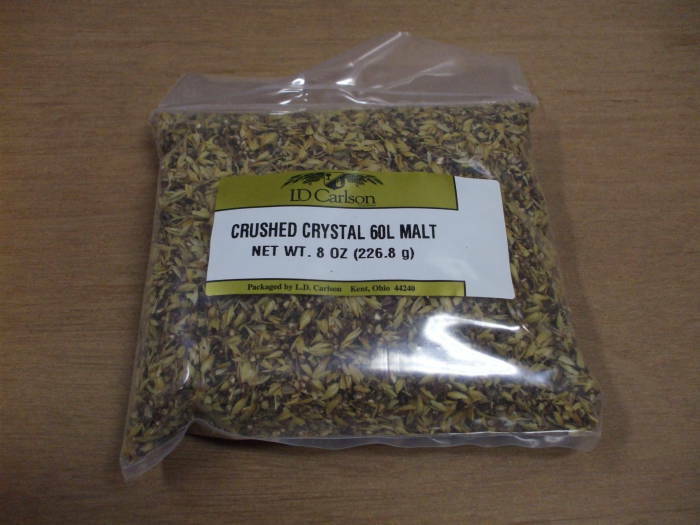 Crushed crystal 60L malted grain, 8 ounces (226.8 grams). 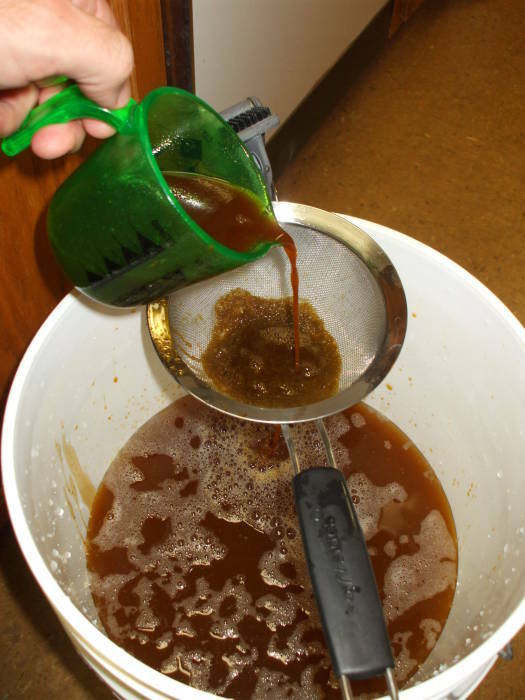 1.1 liters liquid light malt extract, a thick liquid. 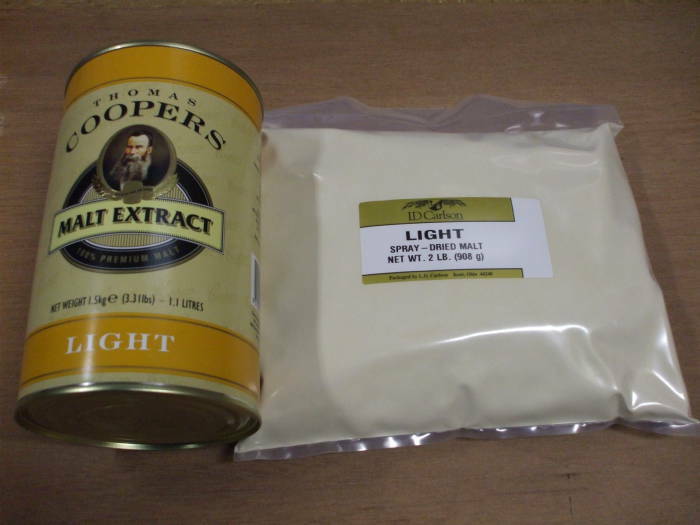 2 pounds (908 grams) light spray-dried malt extract, a very fine powder. 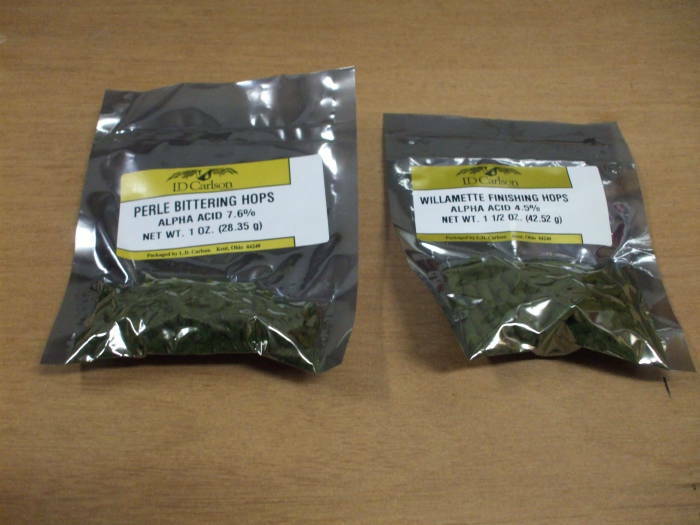 Bittering hops: 1 ounce (28.35 grams) Perle hops, 7.6% alpha acid. 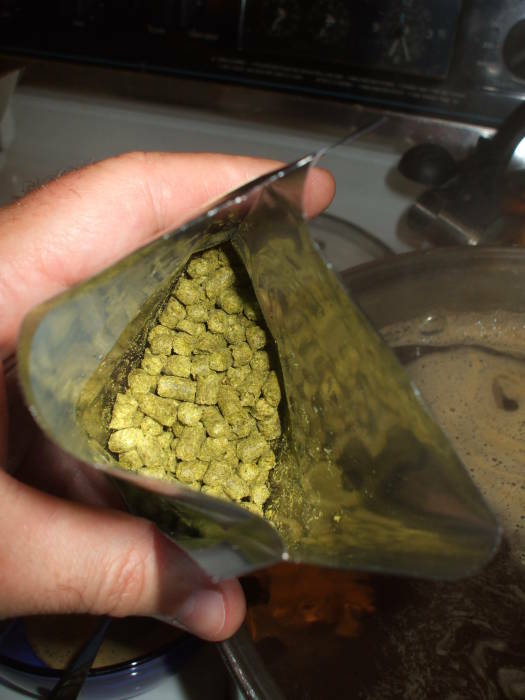 The hops are stored in oxygen-tight plastic packs, kept refrigerated until used. Start by chilling all but about 6 liters of the water to just above freezing. I did this on a cold day and simply set the plastic jugs of water on my balcony, but a refrigerator would work. It isn't crucial to chill some of the water, but that reduce some waiting otherwise required before adding the yeast to the fermenter. 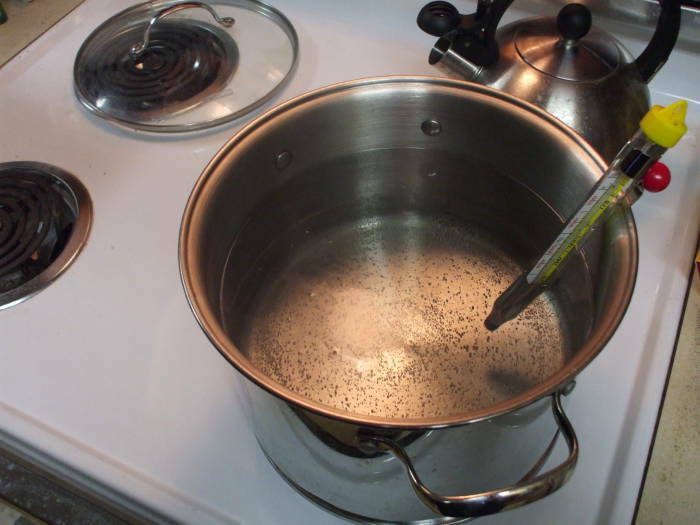 Heat the remaining 6 liters of water to about 85°C (180-190°F). I used a thermometer to measure the temperature, but "about to boil" or "just starting to boil with 2mm bubbles forming" would be reasonable approximations. 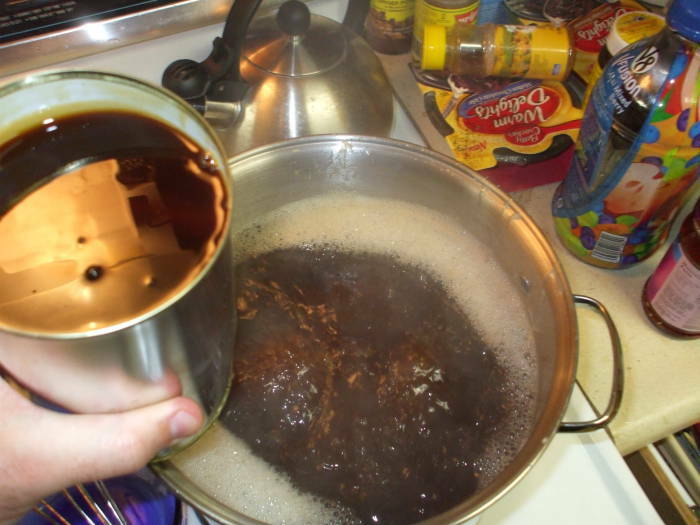 While you're doing that, fill the sink with hot water, remove the label from the liquid malt extract can, and submerge it into the hot water. That will really help it to flow out of the can when you need it in a later step. Without this preparation it's like the proverbial molasses on a cold day. In other words, tremendously frustrating. 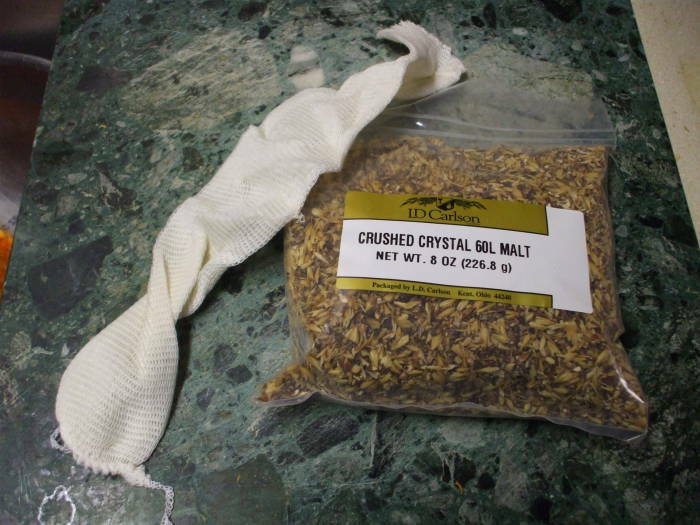 Put the grain into a sock-like cheesecloth tube and tie it off. A friend of mine has used an actual sock for this step, but I wouldn't recommend it. This, of course, depends on the state of your own socks. My socks are not food-grade by any stretch of the imagination. I simply heated the water to the upper end of the desired range, turned off the heat (this was on an electric range), added the grain bag, and placed a lid on the pot. Give the grain at least 20 minutes to steep. I left it in for 30 minutes as the temperate dropped slightly from about 88°C to 82°C. The water took on a light golden color almost immediately, darkening to a brown lighter than that of tea by the end of the 30 minutes. 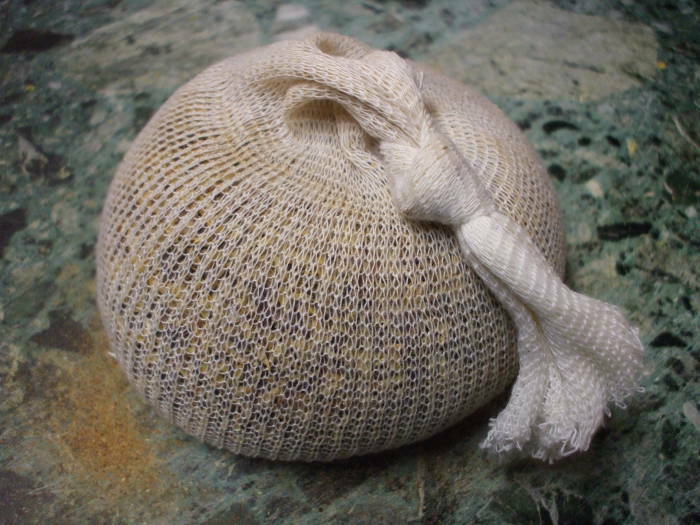 Remove the bag, allowing it to fully drain into the brew pot, and discard the bag. Carefully add the very finely powdered spray-dried malt. I have slowly learned that the right way to do this is to bring the water to a very light boil and then add the malt powder a little at a time while stirring. Add just a little at a time and stir it into solution before adding more. Don't allow it to form floating doughy clumps. 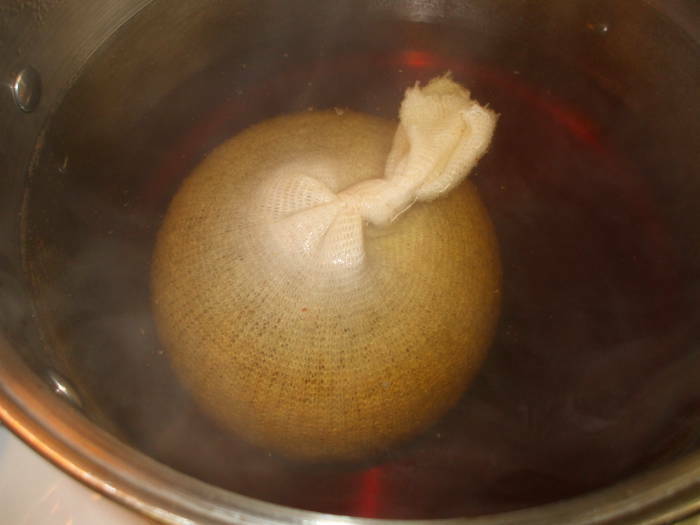 And don't dump in a bunch and let the wort take off on a nearly explosive boil-over. 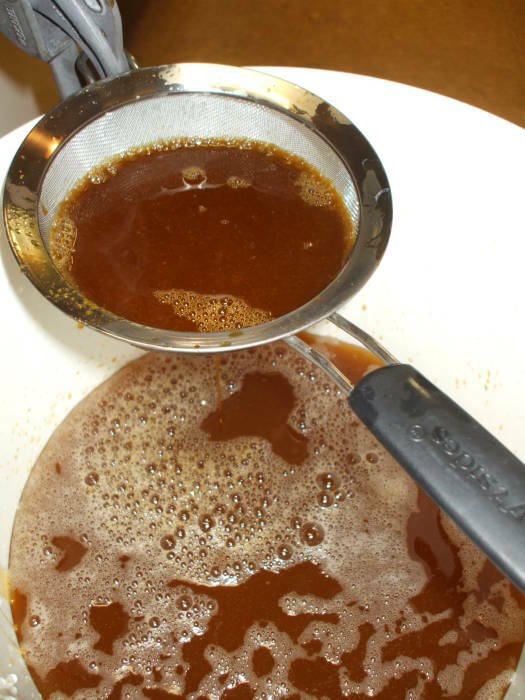 You can add the liquid malt extract after getting the spray-dried powder into solution. Solution, not suspension. Kinda important. There's no such thing as stirring it too much. 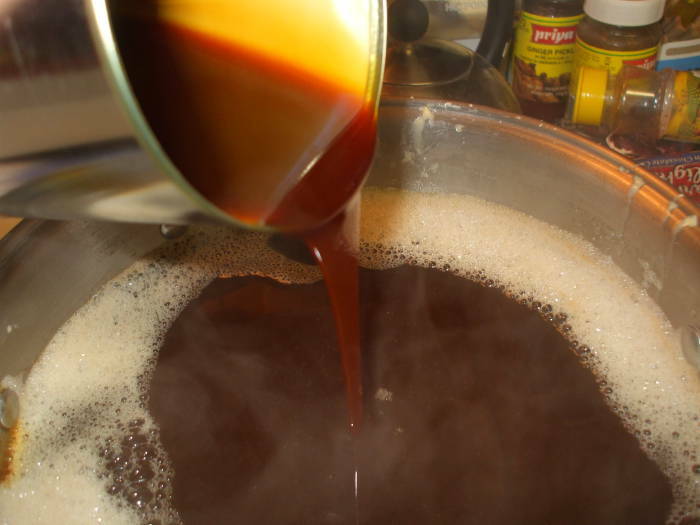 The pot will quit boiling when you add the cooler liquid malt extract. Be careful, stir it thoroughly while you add it and from time to time. Watch the pot to make sure it doesn't boil over. 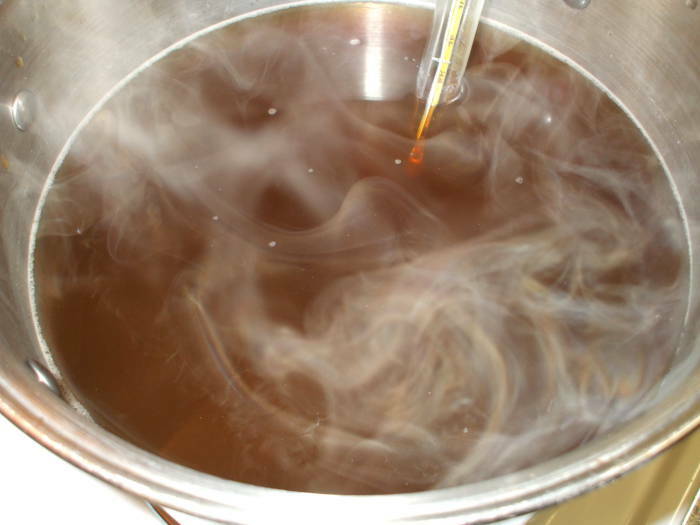 Once you have re-established a stable low boil, it is time to add the bittering hops. 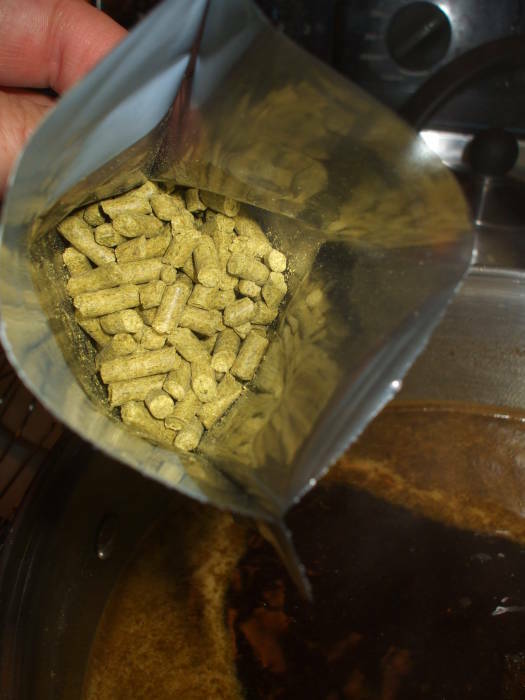 Here you see the hops — vacuum packed hops pressed into pellets. Just drop them in and stir the pot. Yes, the hops will form a rather nasty looking layer of chunky green ooblek. Start a timer — you want to boil the wort for 55 minutes with these bittering hops. 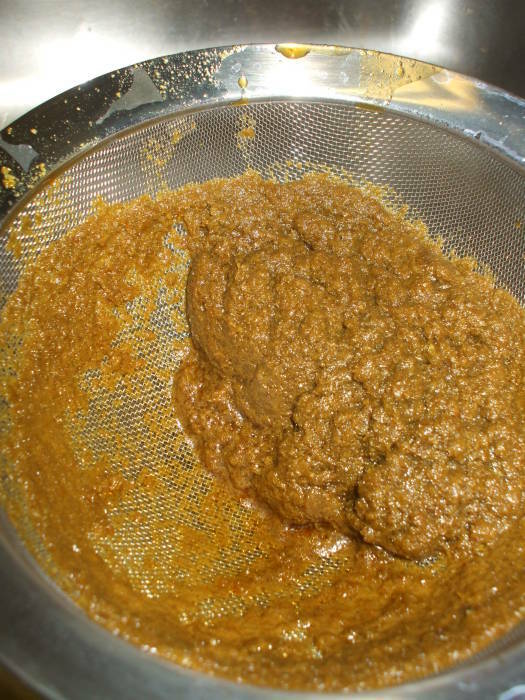 Hops add two components: resins, which provide a bittering effect and can only be extracted with a long boil, and oils, which provide flavor and aroma but quickly evaporate. Boiling these hops for 55 minutes extracts the bittering resin and boils off the flavor and aroma oils. Stir this mess from time to time, "every 5 minutes" according to some. 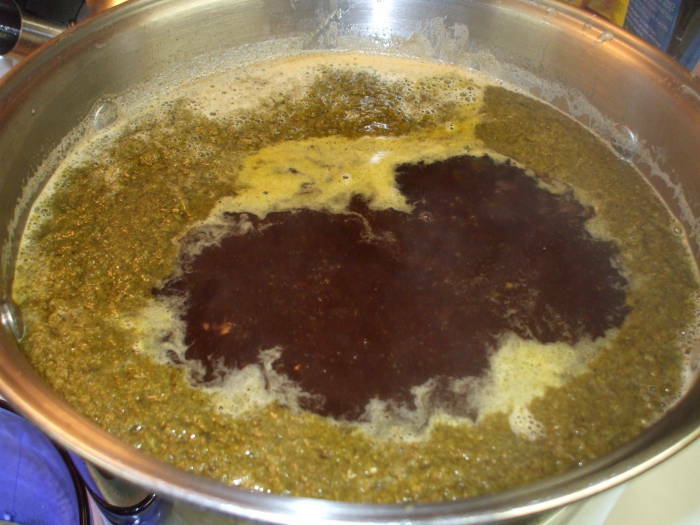 After 55 minutes of boiling with the bittering hops, add the finishing hops and boil for another 5 minutes. 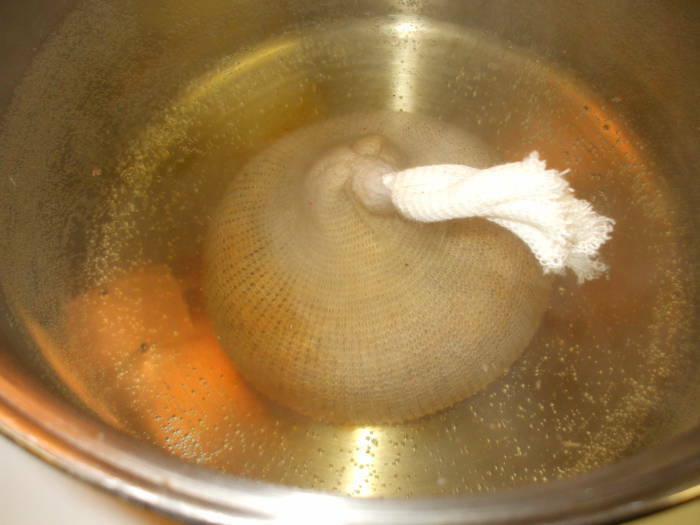 The short boil extracts the oils providing flavor and aroma without boiling them off. They look pretty similar to the bittering hops, they happen to be pressed into longer pellets. The bittering hops had largely disappeared, but these additional hops will cause another burst of surface ooblek. That's fine, stir the whole mess for the additional 5 minutes. After that additional 5 minutes, so 60 minutes total of boiling with hops, remove the wort from the heat and cool it quickly. I simply placed it in a sink with a stopper in the drain and filled the sink around the pot with cold water. 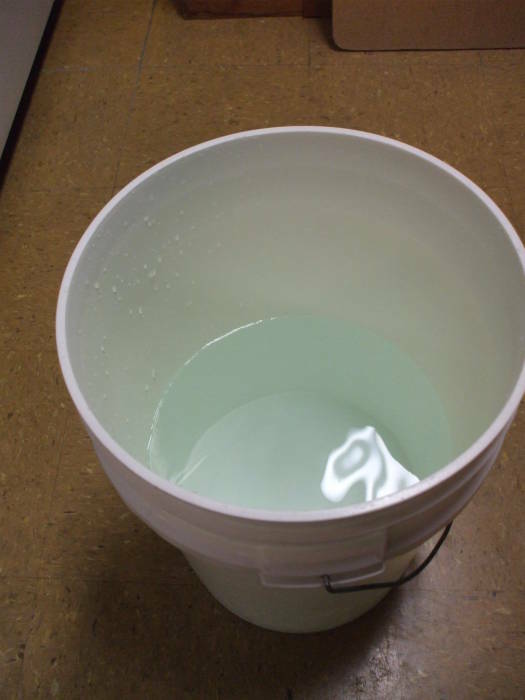 Put the chilled water into the fermentation bucket. A total of 15 liters minus the 6 used in the boil, so 9 liters of cold spring water. Yes, I am using a food-grade plastic bucket of five to six gallon capacity. And yes, I realize that a bucket is a terribly dangerous device. As the U.S. Consumer Product Safety Commission is warning us, "Large Buckets Are Drowning Hazards For Young Children." I have read somewhere that a surprisingly large number of children drown in large plastic buckets in the U.S. in an average year. It seems that there are more children under five who drown in water buckets than there are children under ten who die from accidental gunshots (and don't forget that "children killed by guns" includes active members of the drug trade in their late teens killed in gun fights that they start). A government crackdown on the private ownership and use of plastic buckets is obviously on the horizon. America is awash in dangerous, unregistered, large plastic buckets in the hands of the public, and, perhaps most shockingly, anyone can walk into a hardware store and buy multiple ones with no background check. I have stockpiled a few. Well, two. Plus a third with a hole cut for a tap used for bottling. Anyway, pour the liquid wort through a fine-screened strainer to separate out the trub, the oobleck made up mostly of hop solids. I used a clean plastic measuring cup to scoop out and pour a little at a time. The trub will clog the strainer, so stir it around with a spoon to allow the liquid wort to pass through into the fermentation vessel. Then dump the trub. 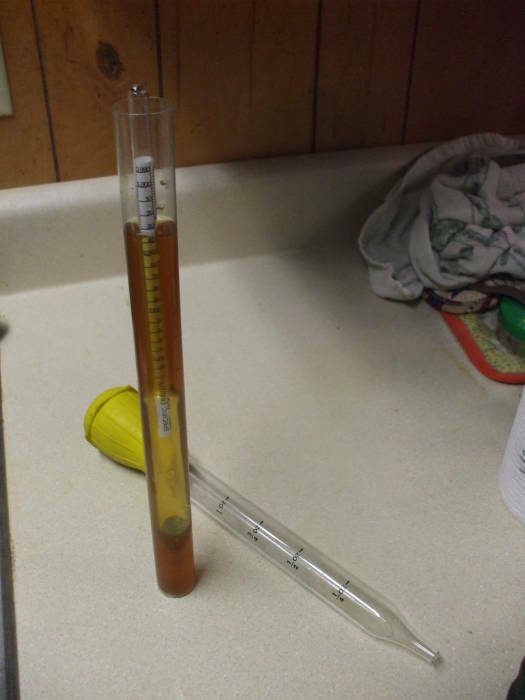 I used a baster to extract some liquid from the fermenter and measured an initial specific gravity of 1.038. Time to pitch the yeast, seal the fermenter lid, and install a fermentation air lock. 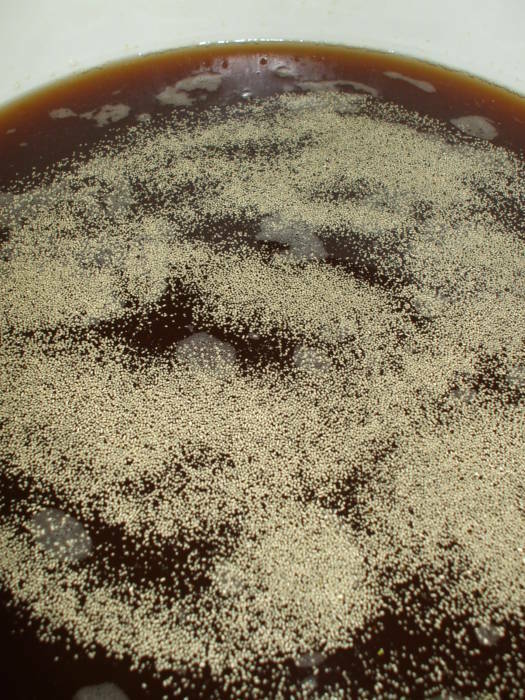 Billions and billions of yeast beasts will do the work of converting the malt sugars into ethanol and carbon dioxide. After a week or two it will be time to bottle the result.